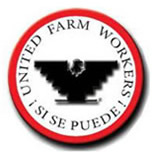 United Farm Workers is a union for farmworkers across the United States. They have a long history of activism in pursuit of improved conditions for farmworkers. They also seek to equip their members with the inspiration and tools to achieve better wages. They believe in integrity, innovation, non-violence, empowerment and a can-do attitude.